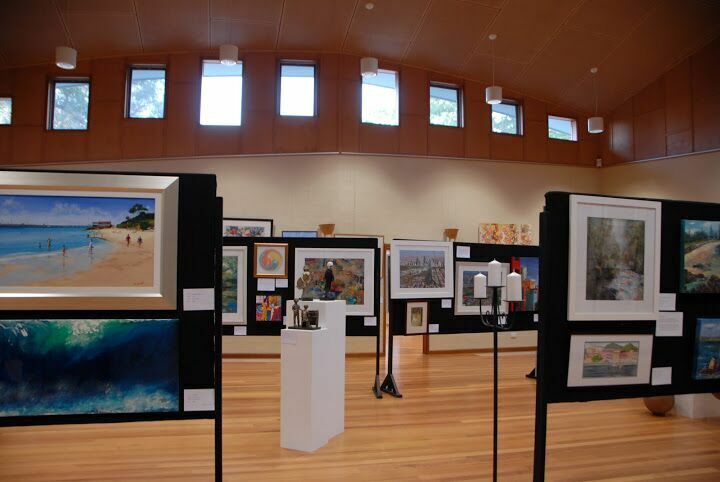 Inspired artworks, art installations and eclectic artistic events brought fresh energy and inspiration to visitors and artists at the recent Warranwood Art Show exhibition held 15 to 17 April 2016. The diverse range of mediums ranged from digital art and photography, paintings, drawings and mixed media variety, sculptural works and ceramics - many fine art pieces were exhibited. Bringing a fresh art edge to the show were several art installations by several creative emerging artists. There was much for visitors to enjoy with music, art, awards, art talk and demonstration, voting in the People's Choice and watercolour artwork for raffle, generously donated by Nadine Dudek, watercolour artist. Award prize-winners were announced at the Opening gala evening and collectively won over $5,000 in prizes in a variety of categories. Independent Judge, Ted Dansey of the Victorian Artists Society gave joy to the dedicated by announcing Best-in-Show and the major 2016 award-winners - Faye de Pasquale, Fiorella Giarrusso, Nadine Dudek, Cherry Manders, Michele Cleaver, Betty Mitlan and Tracey Roberts. Highly commended artworks in categories were also announced, the artists delighted by special mention of their art - Richard Campbell, Tony Weston, Geoff Sargeant, Ron Brown, Jean-Marc Plantier and Liam Kenny. The program of artistic events found visitors enjoying a mix of artist floor talks – a book launch by artist Liz Vercoe and then a watercolour painting demonstration by award-winning watercolour artist Nadine Dudek, whose work was so popular most sold almost before completion. Nadine's generosity abounded with a beautiful watercolour, Jabiru, donated to the exhibition which was raffled over the weekend. Music lovers were enthralled with opera singer Dominique Oysten’s beautiful voice. Visitors to the Saturday afternoon Art, Wine & Cello also heard the sublime cello playing by cellist, Vincent Ward when visitors could sample a range of select wines by local Warranwood award-winning winemaker, Rob Dolan Wines. Two art installations were major talking points. RMIT's Jess Lovell and David Holliday's art installation 'Five hundred and sixty' stood silently with a dense and powerful presence, bringing the plight of children in Australian detention centres into public awareness with the artists creative installation. Juet Sculpture's Chance is Choice, recycled steel with light and sound, art installation greeted visitors before entering the building. Created by Juet Sculptures' Martin Judd and Michael Hyett in their Dandenong Ranges studio, where the artists work and run annual open days, creating unique one-of-a-kind water features, light sculptures and metal artworks from a variety of creatively repurposed materials. 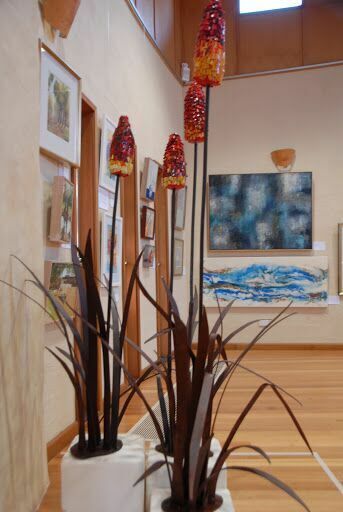 Exhibition Weekend culminated with satisfied visitors and artists. Many shared their positive comments before leaving the show. Art lovers and buyers enjoyed the Oak Hall atmosphere, the artworks and variety in music performances, art demonstration and talks. The art installations brought a new vigour and freshness, visitors enjoyed the beautiful leafy setting of Oak Hall in Warranwood, Victoria. We thank 2016 Independent Judge Ted Dansey, all the exhibiting artists, the inspiring art installations by emerging artists, the music performers and the visiting public for supporting Warranwood Art Show once again. Warranwood Art Show thanks all its 2016 Sponsors whose support encourages and continues to make visible the its vision of 'supporting the artistic community’.